There are a wide variety of garden pots, and while any of them will grow your plants, some are better than others. What is the best, you ask? We believe Gorilla Pots fabric grow pots are the best available, for a number of reasons. What are fabric pots and grow bags? As you may have guessed by the name, these pots are made of fabric. There construction is what makes them so effective at supporting and growing huge, healthy plants. The porous nature of the fabric allows for superior aeration to the root zone. This leads to the air pruning of roots. When a plants root system grows, it extends out towards the walls of the pot. In traditional plastic garden pots, the root will hit the wall, bounce back, and form a ball. When the roots get tangled, the plant becomes root bound. This can stunt growth, and cause a number of issues within the plant. A fabric pot prevents plants from becoming root bound by air pruning. When the roots extend towards the wall in a fabric pot, the air seeks through the fabric and prunes the roots naturally. This keeps the root system healthy, and branching off in different directions, becoming more complex. Fabric grow pots maintain the perfect amount of moisture, as well. They drain well, but not too fast that the growing medium can dry out. Can you reuse fabric pots? Another reason so many growers opt for fabric pots is that they are reusable, just like plastic garden pots. They can be sterilized and reused after each growing cycle, for years. How do you wash a fabric pot for reuse? Step one is obviously removing all old growing medium from the pot. Then, let your pot dry out completely in the sun, so it does not build any mold or mildew. You can then use a sterilizing solution mixed in with your washing machine, and hang dry them in the sun. Gorilla Pots are a brand of premium fabric pots, ranging in size from 20 gallons to 400 gallons. They are perfect for guerilla grows in the foothills, a garden in the backyard, or even for use indoors! 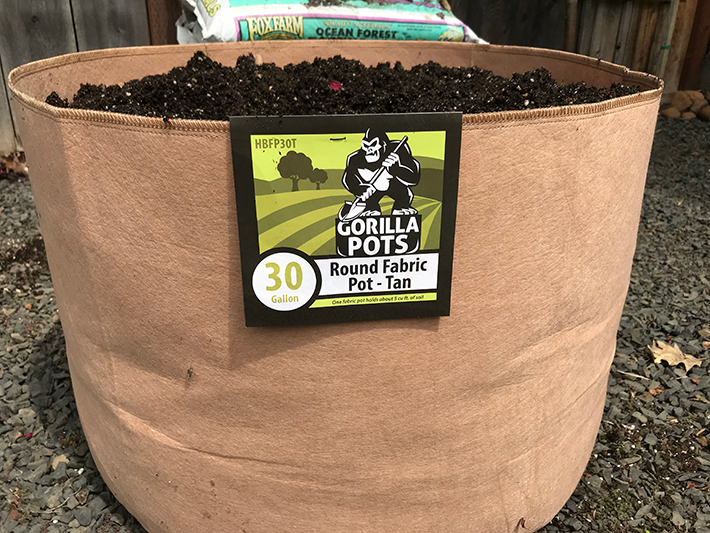 Gorilla Pots are made of polyprolyene fiber, with a non-toxic 3% anti-ultraviolet agent added in to combat the effects of the sun. This prolongs the life of the pot. The fabric used is very breathable, allowing for faster plant growth due to access to oxygen with superior water drainage. If you would like to learn more about which garden pot is right for you, and which grow media you should use with it, check out our guide on the best garden pots for hydroponics and traditional growing.